Digital Jungle Post Production in Hollywood, CA, with the help of RSPE Audio, recently completed phase 1 of their new S6 equipped mix room. 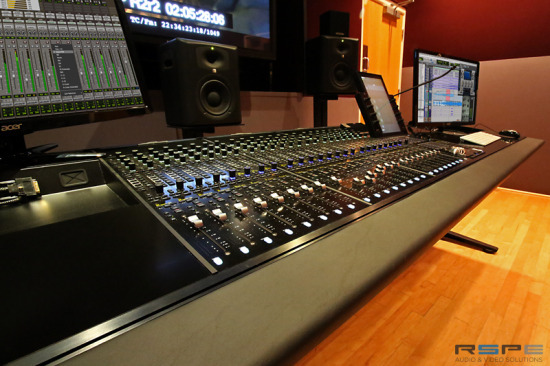 The heart of the mix room is the 24 fader Avid S6 M10 control surface, with a 5.1 JBL monitoring system, new room acoustics, outboard gear and new furniture finishing off the room. The control surface itself is pretty impressive to say the least. The photo above does not do it justice. The desk is 9 feet long and Digital Jungle plan on adding a second S6 M10 in the near future (phase 2) to make this a dual operator workstation. Digital Jungle Post Production is a state-of-the-art post facility in the heart of Hollywood offering a full array of services for film, television, advertising and all content providers. Offering Audio Services including Re-Recording and Mixing, Dubs & Conversions, they also offer 4K DI, and Visual Effects. To find out more about the Avid S6, head over to RSPE where there is an entire microsite dedicated to the S6!